Peregrine BushMaster reloading bullets (VRG3) are the ultimate hunting bullet for hunting in the thicket. The Peregrine BushMaster features are unique meplat and pneumatic plunger action that is near impossible to beat. Performance in terms ofon course penetration after impact, opening at market-leading low velocities, knock down effect and first shot kill makes this the bullet of choice for the well informed hunter. 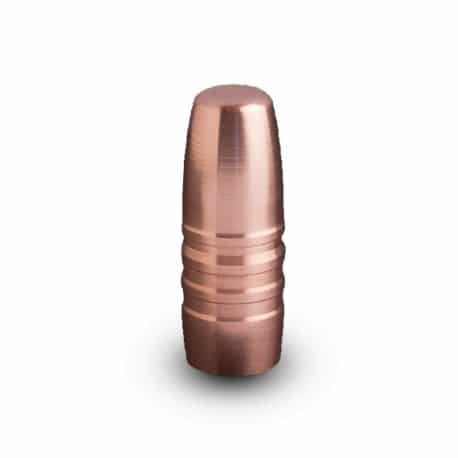 The Peregrine BushMaster is a softer, red copper bullet that utilizes a meplat nose exterior design, with a plunger filled expansion cavity. This unique flat surface (meplat) is designed to deliver a massive kinetic energy dump upon impact. Hydraulic ram energy is swiftly transferred to the brass plunger to initiate the pneumatic expansion process. Initiation actually takes place upon impact on the entry side of an animal skin. This is one of the most important features of the Peregrine BushMaster as it guarantees a near perfect open entry wound adding to the first shot kill capability. 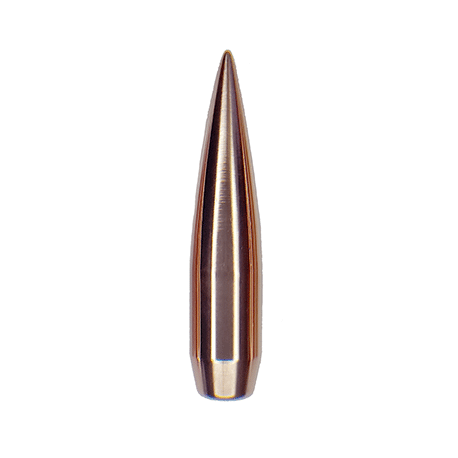 The bullet tip will continue to form into a neat mushroom during the first few inches of penetration after impact and will stabilize the bullet to stay on course, thereby rewarding the perfectly placed shot with reaching and passing through the vitals. Very few of these bullets are recovered as little to no mass shedding occurs, thus maintaining kinetic energy for optimal wound channel formation and penetration. The Peregrine BushMaster maintains its kinetic energy much better than fragmenting bullets even when bone is hit. 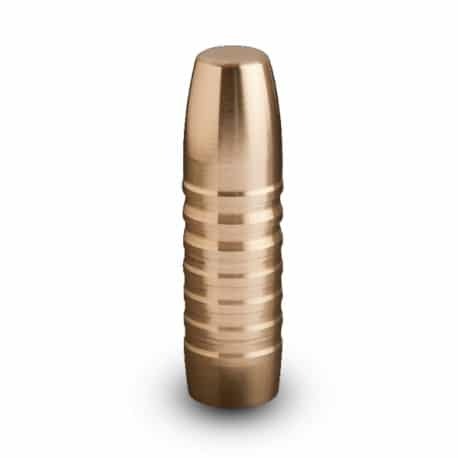 This bullet offers a superb ability for the ethical first shot kill, without the messy meat damage suffered from lead-core bullets. The plunger filled cavity design is incredibly effective at breaking bone without disintegrating the bullet head. Tandem pneumatic pockets strategically placed inside the plunger cavity act as shock absorbers on impact to preserve the soft head and assist with the progressive formation of a symmetrical mushroom. In a thicket, or a denser hunting environment, the Peregrine BushMaster will stay on course even if it shoots through a twig or a small branch – punching a hole through the branch – while maintaining its course and energy through the obstacle and up to impact on the animal. Consistent, predictable expansion and weight retention that performs independent of velocity or target animal (with velocities between 3 400 fps and 1 600 fps having reliably been tested over a number of years). This bullet leaves an open wound channel into and through the animal. As in archery hunting, the bullet punches a hole in the animal’s skin, allowing the entry- as well as the exit-wound to bleed which leaves a noticeable blood trail. Even if the Peregrine BushMaster hits material on its trajectory to the animal, it will resist deflection from its course, thereby ensuring a higher success rate in hunting animals in the thicket. As the expanding head forms into a mushroom, mass is displaced to the perimeter, adding to the stability of the projectile to keep it on its path in a straight line through the animal. When the vitals are reached in the event of good shot placement, the Peregrine BushMaster will pass through the vitals with very limited meat damage because the bullet does not fragment. Due to its unique design features, the Peregrine BushMaster bullet provides increased velocity, while offering less recoil and reduced pressure in the barrel and chamber. The softer material help to enhance barrel life. 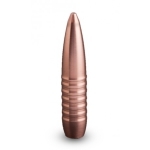 This bullet design resists fragmentation and bending. The Peregrine BushMaster is customized for reloading and crimping. This bullet is ideal for use over shorter ranges (typically 300 yards). The deadly force that it imparts on impact is devastating enough to stop any dangerous animal in its tracks. The brass plunger works on the principal of pneumatic expansion and shock absorption, i.e. the use of air pockets to control progressive expansion without fragmentation upon impact. This plunger design is unique to Peregrine Bullets and does the lion’s share in the formation of a large symmetrical mushroom.